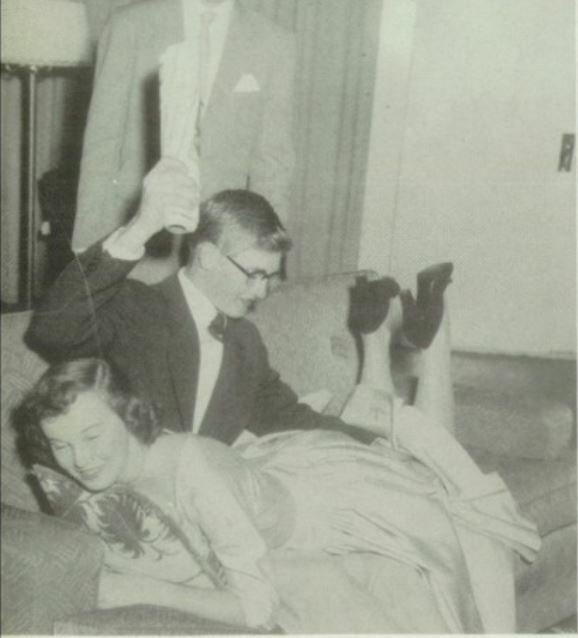 You might think there’s nothing very out of the ordinary about this: after all, a good spanking was an everyday hazard for a naughty girl in early ’50s America. But the cause of the epidemic wasn’t a sudden upsurge in teen misbehavior. 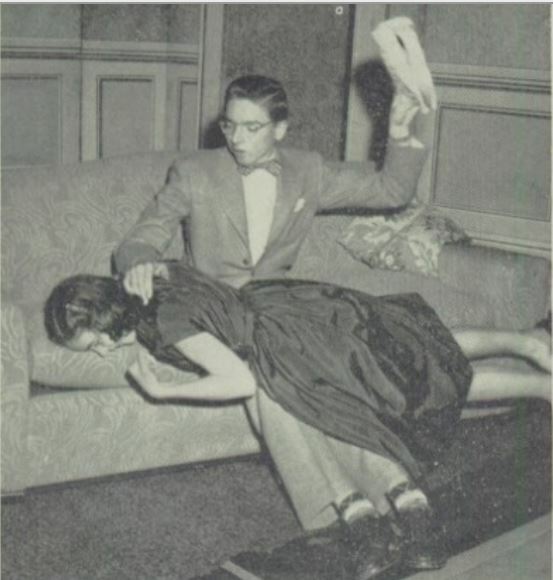 The spanked girls were all appearing in a play, Men are Like Streetcars, dramatized by Christopher Sergel (1918-93) from the 1932 novel of the same title by Graeme and Sarah Lorimer. 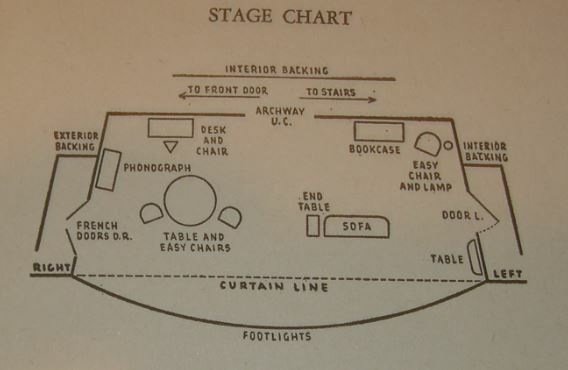 Sergel’s main métier as a dramatist was turning novels, movies and television shows, ranging from To Kill a Mockingbird to Get Smart, into stage plays that were offered for production by amateur dramatic companies and high schools. His agency was the old-established Chicago firm, the Dramatic Publication Company; he eventually rose to become its President in 1970, and held that office for the rest of his life. 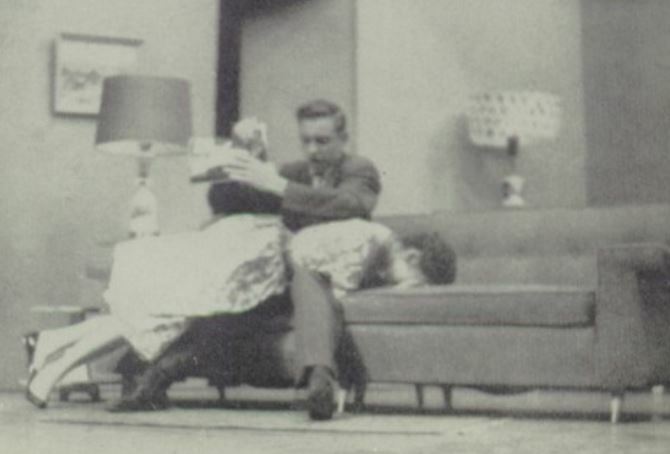 The company still offers many of his plays, including another with a spanking scene that we’ll come to later in the series, though sadly Streetcars was retired from active service long ago. Maudie’s big problem in life is her elder sister, Sylvia: she gets to go to all the parties and she gets all the boys, while Maudie herself is treated like a little girl. She becomes so frustrated that she decides she has to get Sylvia out of the family home by finding her a husband – and at 19 years of age, believes Maudie, Sylvia is nearly an old maid, so the ‘streetcars’ maxim can’t apply to her. She does her best to get Sylvia together with Ted, the son of a banker who is considering her father and his partner, Jerry, for a business loan. 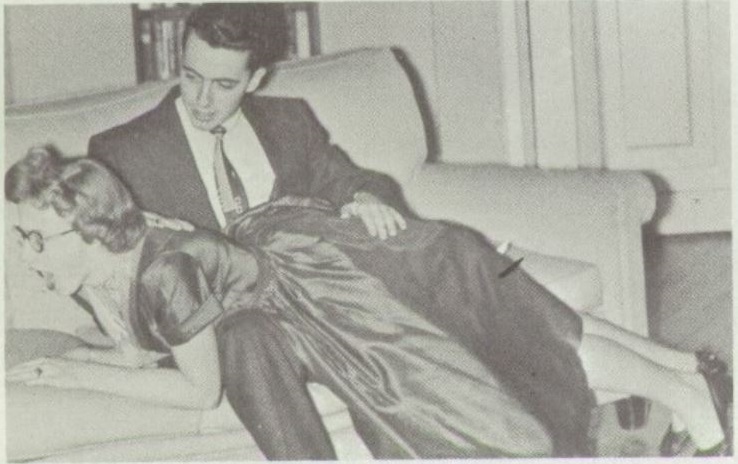 She isn’t aware that Sylvia actually loves Jerry, and has done ever since high school. Near the end of the second act, a household party is in the offing, when Jerry confronts Maudie with her lies which are ruining Sylvia’s reputation, and incidentally seem to have caused the bank to go cold on the loan. MAUDIE: Is this a home or a police station? JERRY (determined, crossing directly to her): You’re going to explain everything and put a stop to all this foolishness. MAUDIE (he must be crazy): Do you want to spoil it? JERRY (snapping at her): Spoil what? MAUDIE: Jerry – what’s the matter with you? JERRY (his anger mounting): You haven’t answered! MAUDIE (really surprised, backing away a step): I’ve never seen you like this. JERRY (barely able to control his temper): What did you say to Ted? MAUDIE: You ought to be able to figure out what would intrigue a man. (Taunting him.) You are a man – or are you? With this, he grabs Maudie by the back of her neck. 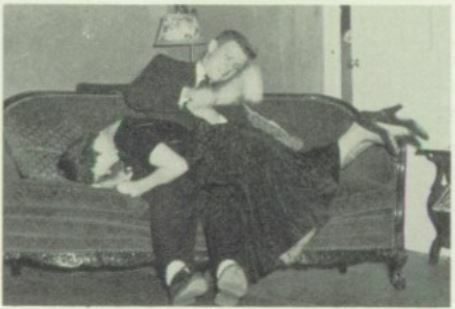 He sits on sofa and pushes her head down so that she falls over his lap. 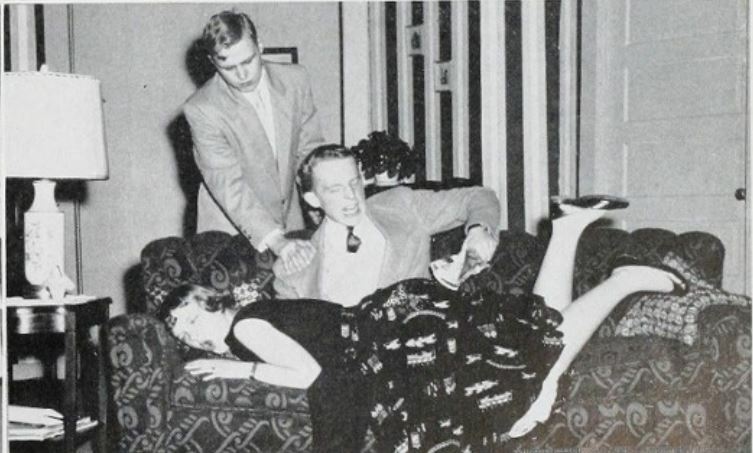 He grabs up a magazine from table right of sofa and starts spanking her with it. JERRY: You’ve had this coming for sixteen years – of all the meddling – self-important – imbecilic – brats! MAUDIE (at the same time, wailing): Let go of me! Owww! Help! Murder! Stop it! Owwww! Ted has come in during the spanking. He crosses to Jerry and slaps him on the back. TED: Hey! Cut it out – you wife-beater! Maudie scrambles away, and with her back turned, tries to straighten herself out. Jerry’s line is obviously meant to be delivered so that each adjective coincides with a smack on her bottom, and this establishes the minimum duration of the spanking in any production: it just can’t be done in fewer than four smacks, probably more since Ted needs to have time to come in, see what’s happening, cross the stage and intervene. Ted offers to throw Jerry out, but Maudie wants more than that: ‘I want you to kill him.’ Jerry urges her to be sanguine: ‘Don’t take it too hard. Now you’re one of those lucky girls that’s been on my lap.’ A stage direction calls for Maudie to rub ‘where she was hit’, but she is able to sit down on the sofa soon afterwards. Maudie later complains to Sylvia: ‘He struck me! 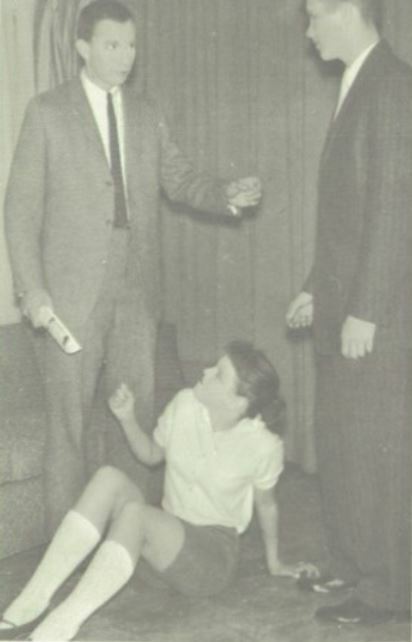 Repeatedly.’ But her meddling has a good outcome: Jerry sends Sylvia flowers for the first time since high school. And, Sylvia explains to her mother, ‘he was so mad at Maudie for promoting Ted, he gave her a paddling’. Mrs Mason smiles. ‘I’m sorry I missed that,’ she says. 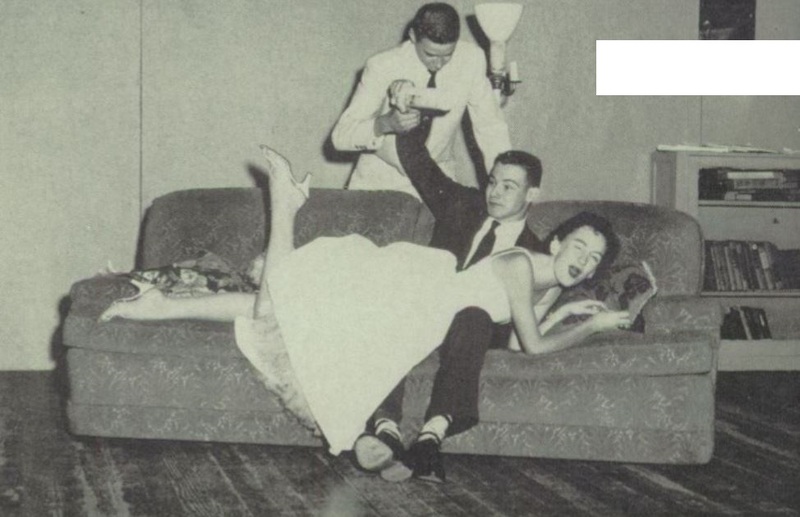 … but you’ll just have to imagine the rollicking laughter for yourselves! 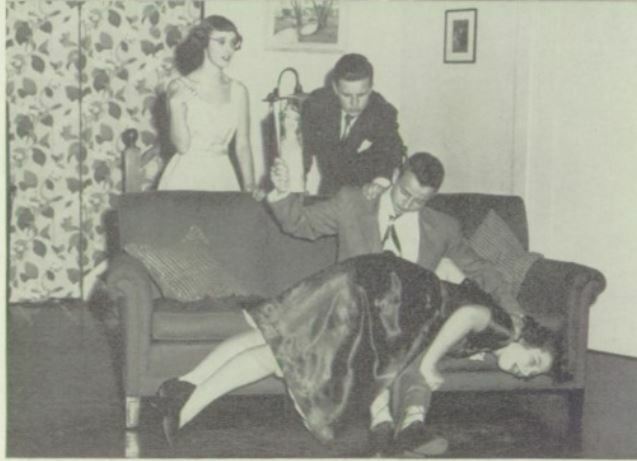 High schools across America regularly produced plays in the junior and senior years as a social and educative experience for the students: they learnt teamwork and practical skills, and the plays usually taught lessons about decent behavior and social responsibility, which meant that a fair few of them included spankings for naughty girls who crossed the line. We’ll encounter some of them in later installments. But Streetcars was a high school phenomenon. 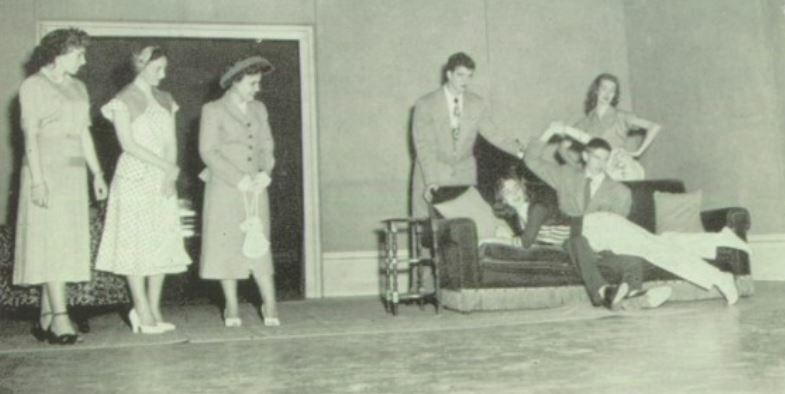 Although publicity for the 1951 Dupo production enthusiastically spoke of it as a ‘Broadway classic’, it was never professionally produced; in fact, I know of only one non-school production, given by the Fayetteville Dramatic Club, West Virginia, on August 8, 1952. 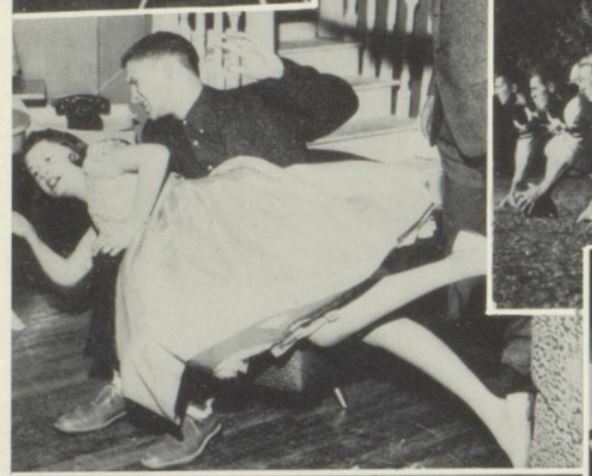 But that may simply be because school productions are easier to track down, thanks to that annual monument to teenage enthusiasm, optimism and narcissism, the high school yearbook, many of which are now freely available online. Each year, in most schools, a book would be compiled by members of the outgoing senior class, documenting the school’s activities and achievements of the year, or else those of the class in the longer course of its school career. 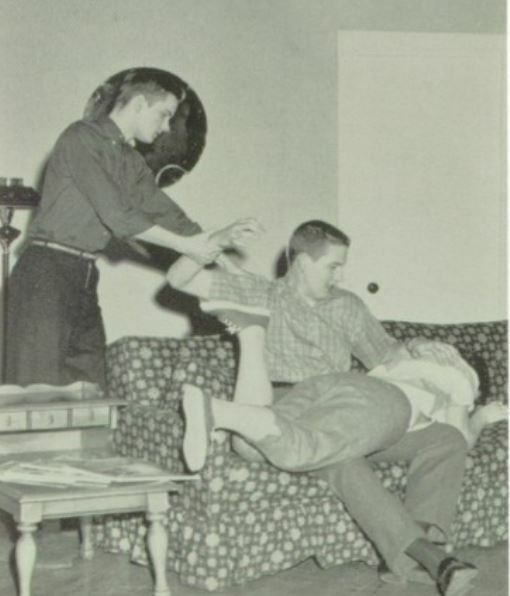 There is usually a record of the school’s dramatic productions for that year (and sometimes also the year before, if the editors were more interested in what their particular class did, even as juniors). 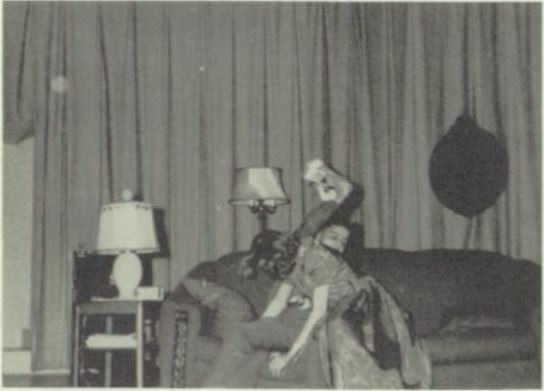 Often there would be photographs from the production, obviously concentrating on the scenes that were considered the highlights. 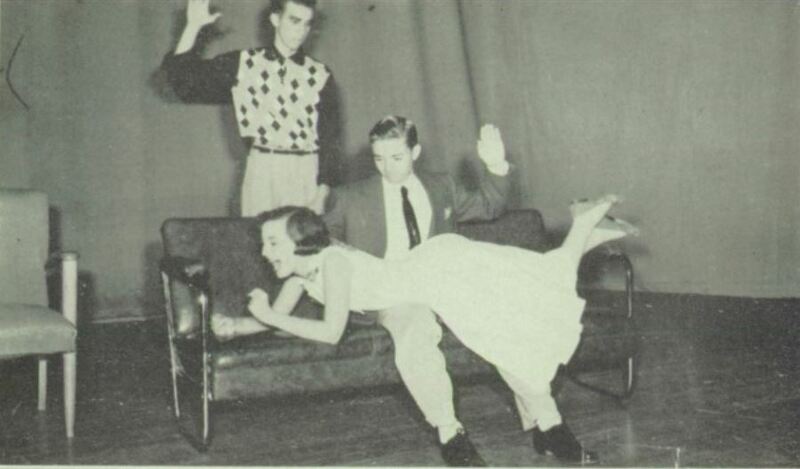 And, like I said before, the highlight of Streetcars was the spanking scene! Now we’re going to take an overview of the whole history of the play, school year by school year, from its beginnings to its eventual demise. I won’t document every single production – even if I could guarantee its comprehensiveness, such a list would be laborious to compile and tedious to read – but I shall aim to show at least one photo from each school year, except for a handful where the play was either not produced at all, or no spanking photos have so far come to light. Maudie Mason, prepare to be spanked, and spanked, and spanked again! 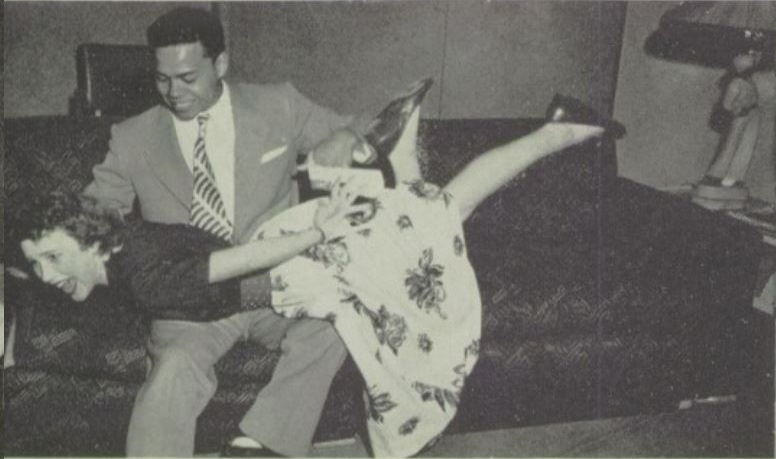 With so many productions, and only so many days in the year, it’s not very surprising to find that many performances took place on exactly the same day – which means that the spankings must all have been happening more or less simultaneously! There are several particular ‘golden days’ when this phenomenon occurred, but the record-breaker was Friday, November 16, 1951, with no fewer than seven simultaneous performances, though of course we have to allow for a slight variation across two US time zones. 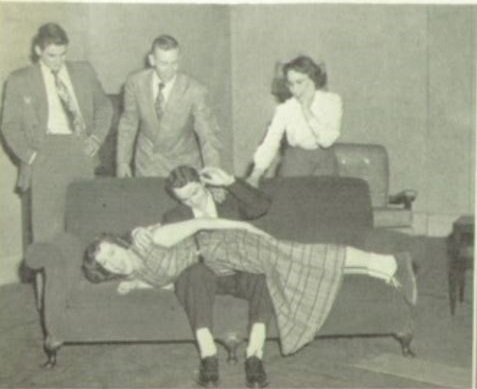 … while up in Michigan, Streetcars was also the junior play at Saline High School, with John McCoy administering the spanking. 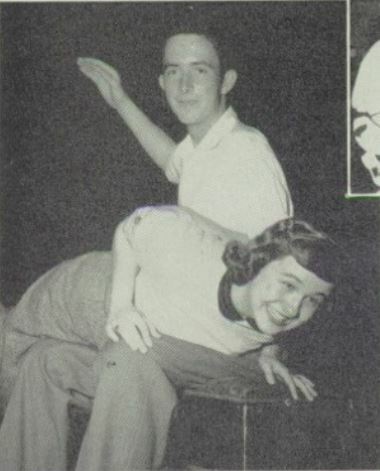 We don’t know to whom, because the yearbook editors not only failed to include a photo of the spanking but also ineptly left Maudie off the cast list – but whoever she was, she could look forward to a second dose the following night. 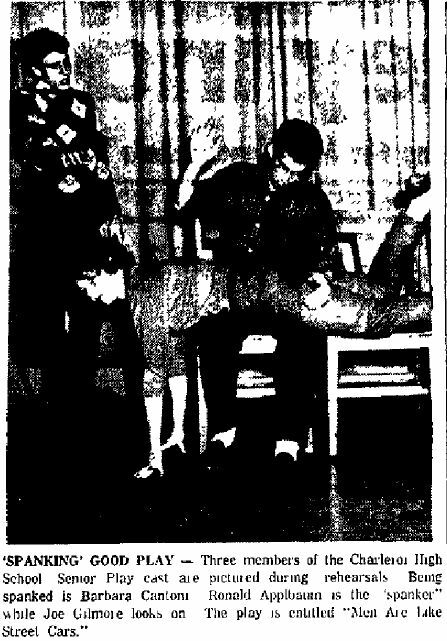 Next we go down from Wisconsin to Illinois, where Doreen Zimmerman is being spanked by Milton Sherman in the junior play at Eureka High School – another one with a second performance to come on the Saturday night, and another one with no picture. 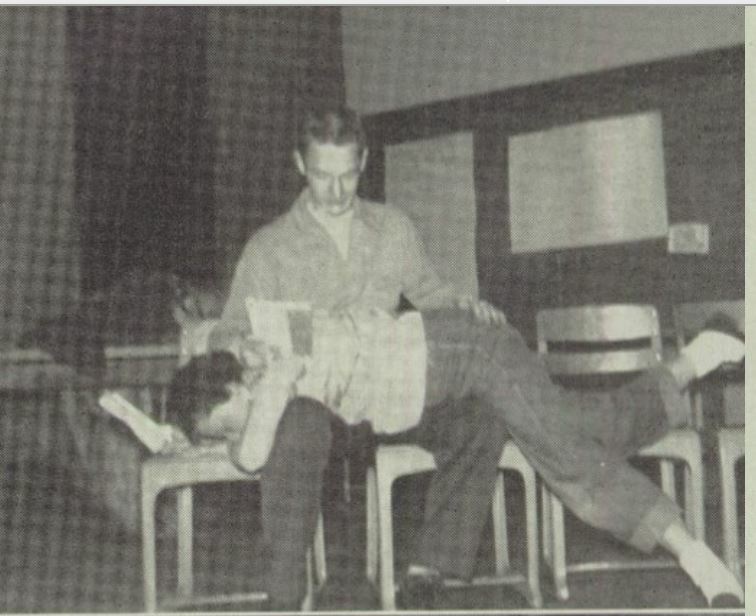 And finally, at Greenville High School, the junior play is already on its second performance, and Pat Pacatte’s bottom is undergoing stern measures from Norman Taylor. Now, that didn’t happen anywhere south of the Mason-Dixon Line! In fact it’s the junior play at the obviously admirably liberal Chaffey High School, Ontario, California. Jerry is Joe Agopay, and the indignity of the spanking, and the spanking alone, is being suffered by Karen Ellsworth as Maudie. Interestingly, the school also produced Stag Line, the sequel, that same year, but with a different student playing Maudie. There were at least 7 productions. 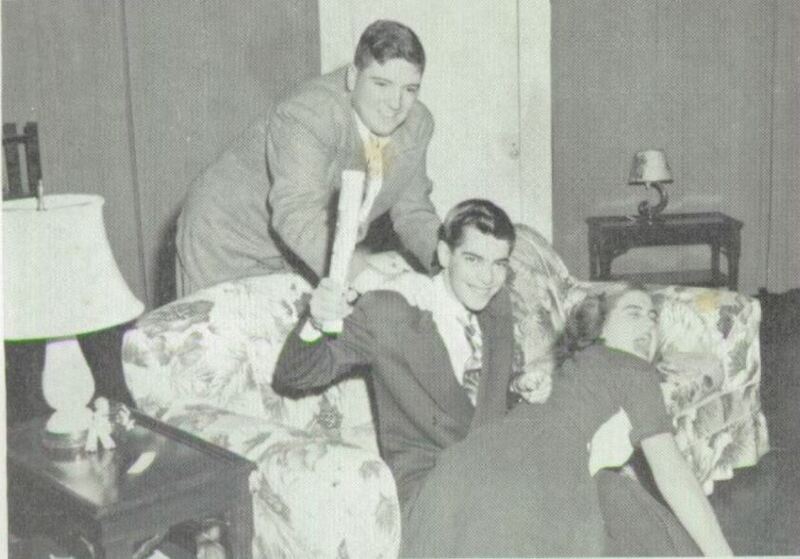 The senior play at Charleroi High School, Pennsylvania, with Ronald Applbaum and Barbara Cantoni, illustrates how the newspapers used to love a good spanking scene. 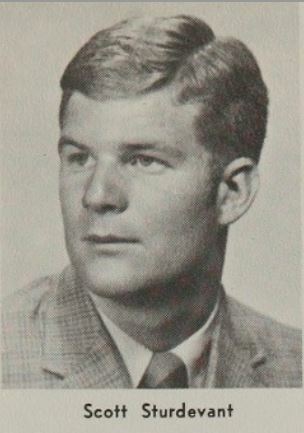 The second, clearer photograph, snapped a few moments later at the same rehearsal, is the one that appeared in the yearbook. I’ve always thought that in this photo Ginny looks a lot like Carole Ann Ford, who was playing Doctor Who’s granddaughter Susan over in Britain at the exact same time, and who was famously threatened with ‘a jolly good smacked bottom’ in one of her episodes! At this point in the play’s history, with the clear downturn in its popularity, the Dramatic Publishing Company decided it needed a makeover, which meant in practice, giving it a new title. Out went Men are Like Streetcars, and in came It Couldn’t Happen to a Nicer Girl. … and in this year, although there were at least two productions, I have photographs from neither of them. And Maudie was junior Mazie Rice, seen here in costume for the production. 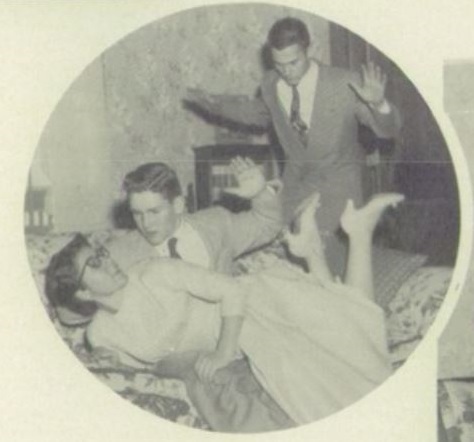 Given the way teen fashion was going at the time, she probably had to wear a pantsuit for the spanking scene! … and one in the school year 1973-4 at Hood River Valley High School in Oregon, but for this final outing we don’t even know the name of the girl who played Maudie. And then the play disappeared into obscurity. At some point, the Dramatic Publishing Company stopped offering it, so it remains the least likely of Christopher Sergel’s plays to be picked up again. Have you been keeping count? That gives us a grand total of at least 364 productions, and that’s only the ones I’ve been able to find using easily accessible online archives – in fact, it must be only the tip of the iceberg! So that’s an awful lot of American girls who were soundly spanked in the name of art! 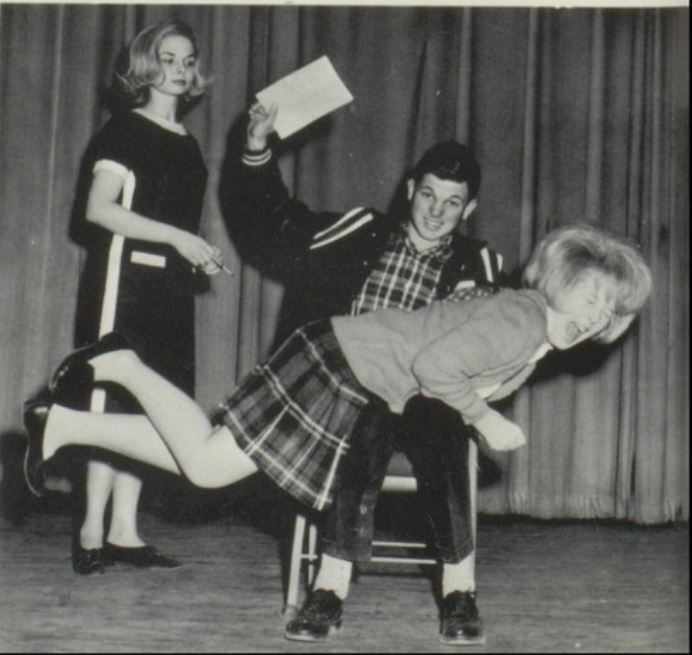 But if you’d seen the performance the day before, you’d have seen Patricia Hoyer being spanked by Ross Flanagan – though sadly there’s no photographic record of that event! But how I wish the later ’60s and early ’70s were better documented! If you have enjoyed these pictures, you can find many more here. But remember, everything in this article, except for the script of the play, was compiled from resources that are freely available on the internet. This is research that anyone who’s interested can do for themselves, and there must be a lot of material out there still waiting to be found and shared. Streetcars spanking pics are like streetcars… there’ll always be another one along soon! Note: Figures for numbers of productions correct at the time this article was republished; more will no doubt be discovered in the future!